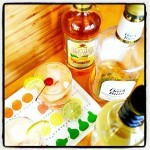 A copycat of Trader Vic’s Original Mai Tai~ cool, refreshing, tangy and tart! The perfect cocktail to serve for any get together where you want a classic Tiki vibe! The best tropical drink ever……. A Trader Vic’s style Mai Tai! This weeks edition of Friday Cocktails is a Mai Tai that is rumored to be the original recipe from the original Trader Vic’s. Many variations are famous these days in any tropical bar, hotel or tiki lounge. It’s tropical flavor is highlighted by orange citrus and full of two kinds of rum. There is a story that when the original recipe was made, it was made for some friends visiting Trader Vic’s from Tahiti. When the lady took a drink she exclaimed “Maita’I roa ae” which translates to very good! Thus the name….Mai Tai! Ingredients for a tropical cocktail! I love this drink, not only because it tastes really good! 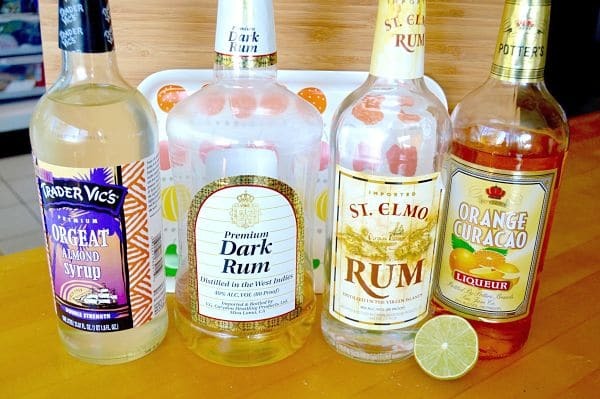 I love the icy coldness, the tropical flavor, the subtleness of the rum(s)…… on a side note……a little info on the difference between light and dark rum. Light rum is aged in a steel container while dark rum is aged in a barrel (usually oak.) The difference in the flavor is the barrel imparts some depth/strength to the Rum thus it tastes a little stronger than the light rum. Oh, I almost forgot. I love the cherry! I mean who doesn’t like a cherry in their tropical drink?? You can also serve it with some sliced fruit (pineapple, orange, lime) and it looks pretty cool with those cute umbrellas or even an orchid if you have one! The traditional drink is served in an old-fashioned glass. But if you don’t have that, use what you have. I also like that Trader Vic’s was one of my dad’s favorite places to visit when I was little. It always makes me think of him when I have one. But today…. Go make a Mai Tai! When you are looking for a fun tropical drink that is super easy to make.....look no further! A Trader Vic's original Mai Tai is just the ticket for an amazing cocktail! Add Rums, curacao, almond syrup and lime juice and shake very well. Strain into 4 chilled, iced old fashioned glasses and garnish with your chosen Add-ins. 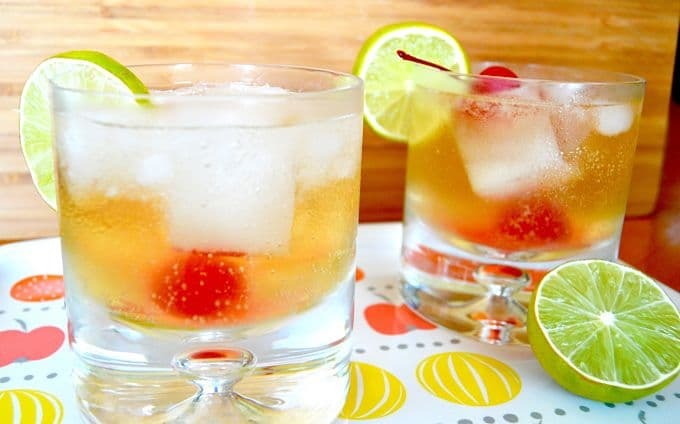 « A Gin Rickey; A Refreshing cocktail! I don’t drink but this looks great! Love the photos! Trader Vics is the original. Looks like they could have learned a thing or two from you! Wow, I use to LOVE going out to Trader Vics. Delicious drinks and so much fun! This one looks fabulous! This is a perfect cocktail for McAllen, Texas where my husband and I recently moved. Our climate is subtropical, and this would be lovely on the patio before it gets too hot! Yes it would…. I hope you enjoy them!! I’m going to show this to my mother, she is a rum drinker and would love this cocktail. Gorgeous pictures btw.. Cheers! Looks like a fantastic cocktail!